Well here I was taking Dave out again fishing. I took him out fishing earlier in the year for tench where we managed a good few to just over 6lbs. He said that he wanted to catch some chub and barbel from the river in August and sure enough the time approached. We agreed to meet today at 7am. We had discussed the days events and decided that we would catch the chub and barbel on a varity of methods and baits. First off was a spot of floating crust chub fishing. We were fishing a tail end of a weir pool where many chub drifted tight against the steep far bank. The rig was very simple just a small loafer float and a size 8 hook 3 ft from the float……. Simple! The second method was to fish for barbel with pellets. First spotting them and then tricking them……..the action with this came very fast. The last method was hemp and casters the bait and wait approach…….this ended in disaster, read on. The crust fishing is a very exciting method of fishing and needs many skills to fool the chub. It’s a case of drifting the bait through the swim without any dragging of the bait. We catapulted a few crusts out into the target area where the chub patroled. Sure enough after a few crusts went through the area a few came to the top and started taking them. After about 10 minutes of feeding them it was time to tackle up. Dave did the business here, 5lb line and a light 6oz T/C rod with the loafer float and the size 8 hook with the crust attatched. The cast was made by Dave under some tree’s which was a challenging cast at times. Soon the chub were coming to inspect the crust and one made the mistake and took it. Dave struck and was impressed with the first thrust of the chub as it escaped for freedom. He had it soon ready for netting. It was a small fish of a couple of pounds. We continued to feed the swim and still more chub were feeding. He caught one more of 3lbs 12oz off the top. Next we fished a swim that was prebaited with hemp and pellets where Dave had another smaller chub of a few pounds. So we decided that 3 chub in a couple of hours was not a bad start and perhaps it was time to move on. So here we were fishing a swim where I had been chasing them and not catching. We looked into the swim from the bridge and saw them in mid water amongst them there was three barbel one of about 9lbs and another slightly smaller together with one of 6lbs. We watched them and then threw in a hand-full of pellets and sure enough they came up to feed and Dave’s jaw just dropped. He couldn’t believe it! I thought I should have dropped the rig in before doing this and thought I had messed things up. You can see this on the video. Anyhow we put the hooklink in (method 2 ) and a bag of pellets and after 30 seconds Dave said that there was a tap on the end. He struck with a little encouragement from me. The rod arched over and he was playing a good barbel, you could see he was on one! Between us and the barbel were a load of cabbages but I knew these would part or break off and as he played the barbel it came closer and closer. It was good one. The swim was in tatters, leaves from cabbages drifted downstream in the aftermath of the fight. But at least we had our goal a good barbel of 8lbs 2oz. We decided after taking the photo’s that it was time to move on. We walked another stretch and found two anglers in each of the swims we wanted to fish so we moved again. The next method on a new stretch was to fish casters and hemp. We fished a sharp bend with a fallen willow which had been there for years. We baited with about 2 pints of hemp and casters our thoughts were to draw the chub and barbel up out of the willow onto the bait. As it was it looked as though it was just the chub that put in an appearance. We walked off to feed some other barbel and chub. Some of the barbel were doubles even though they were in mid water I thought a few pellets might get them feeding so in went a few pellets. We returned to the swim where we had fed the casters hemp to see lots of chub feeding on the loose fed. That was it we cast out and waited for that take. The rig was a simple 3 rubber casters on a hair rig and a size 10 hook. I think we lost 2 fish in this swim in this swim and it was a disaster……..I think the term Rodney and plonker came to mind. We did chuckle though and Dave thought the bait and wait method was great as he could see. We went and fished another swim where we saw some really large chub feeding on the pellets we threw in. He stationed himself close to the fish as I gave a running commentary of what was happening. The big chub didn’t put in an appearance but a small one of about 12oz did. 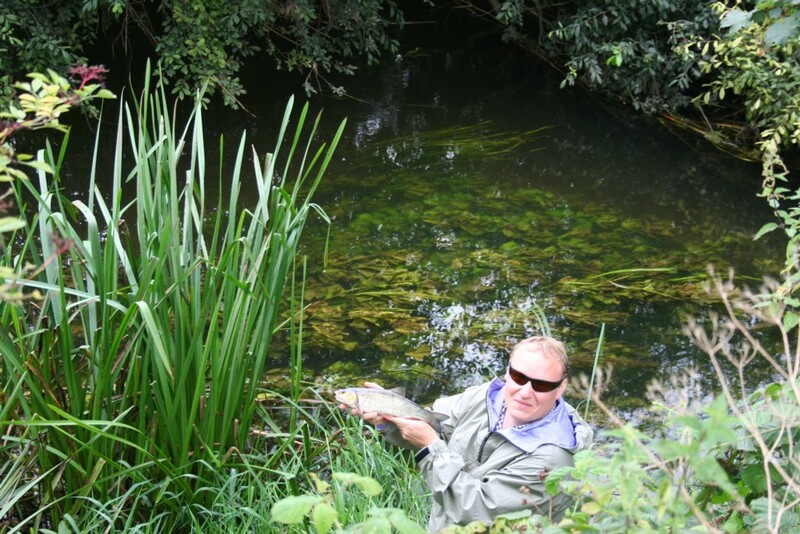 We then went down to a swim where we had seen a couple of very good barbel. We threw a few pellets in. 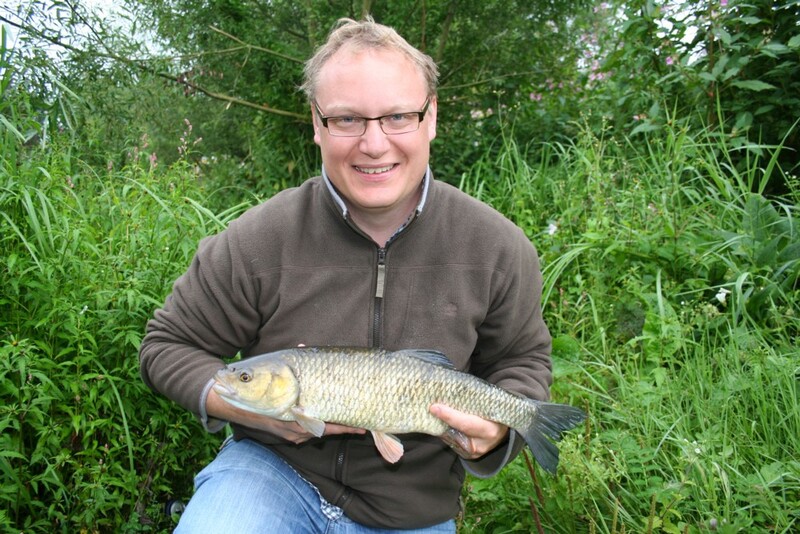 After about 10 minutes are so a barbel came up to feed, then another and they looked a good size. Finally the rod tip went round and Dave lifted the rod and the fight was on. The first twist and turn had it looking like a good barbel into double figures, then disaster the hooklink broke for no reason. Dave was devastated and the look on his face said it all. We think he may have not given it enough line and ……….I’m saying no more. We said that fishing is a funny old game and why do the biggest ones get away. We fished the same swim which we fed with the casters and hemp as the chub were still mouching around. This time we used pellet and a bag approach. After a 10 minutes the chub came back into the swim and soon Dave hooked another chub, only to lose it in some weed close in……oh bugger! I’m unsure what we could have done but it was a good, but painful lesson for Dave. For the price of a £6 day ticket he can go back and try again. This entry was posted on Friday, August 19th, 2011 at 9:16 am	and is filed under Uncategorized. You can follow any responses to this entry through the RSS 2.0 feed. Both comments and pings are currently closed.